Looking for the latest in stylish footwear? If you love shoes but don't have a fortune to spend, why not see what you could save with a Barratts voucher code? Whether you want a smart new pair of court shoes for work, some sky-high stilettos for a glamorous look on a big night out or some comfortable Birkenstock sandals for relaxing in the summer months, a Barratts discount code will help you look great without spending a fortune. Founded way back in 1905, the W Barrett Boot and Shoe Company – as Barratts was then known – grew through the years to become one of the leading shoe manufacturers in Northampton, the traditional home of quality shoe-making through the ages. Today, Barratts combines its rich heritage with a thoroughly modern business model, offering quality footwear at affordable prices to customers around the country. Barratts is committed to retaining their values while offering an unbeatable online service. Their comprehensive website allows customers to browse a wide selection of shoes, boots and other footwear, available to search by category or by brand. Want some hardy yet stylish winter boots to take you from the office to brisk walks in the countryside? Or perhaps you're after an elegant pair of hair heels to add the finishing touch to a special outfit for a big night out? Whatever you're looking for, Barratts has a fantastic range for you to choose from. Looking for men's footwear? Barratts stocks a selection of quality shoes, boots, sandals and more, with everything from sturdy workboots to cool trainers available for delivery straight to your door. And for those who always work outside, they even stock a range of Wellingtons for men, women and children to take you from the field to the festival in style. At Barratts you'll find all of your favourite footwear brands, including Sketchers, Birkenstock, Cushion Walk, CAT, Crocs, Dolcis, Hush Puppies, Puma and more, as well as Barratts own quality brand of excellent value shoes. Got fashion-conscious youngsters to cater for? You'll also find a wide range of shoes and boots for children and teenagers, including those from top brands like Rocket Dog, Kickers, Zooligans and more. Thinking about accessories? At Barratts you can browse a great collection of bags and rucksacks, with everything from school bags and rucksacks to elegant handbags that will help you stay stylish on a big night out. Want to get shopping with Barratts? With a Barratts voucher code you can enjoy fantastic savings on their selection of shoes, boots and accessories. So whether you want to dress to impress or your focus is on comfort and warmth, a Barratts discount code will help you save the pennies while you shop. Browse our website until you find a Barratts voucher code that suits you, then navigate to their website to begin shopping. Click on a product for more information, then choose a size and click 'Add to basket' to buy. Enter your Barratts discount code in the box provided and click 'Apply voucher'. If you've enjoyed shopping with Barratts, you might also like to check out more great deals on footwear at stores like Debenhams and TK Maxx. Or, if those aren't right for you, you'll find plenty more to browse in our Fashion, Accessories and Jewellery section. True bargain-hunters always scour for Brantano voucher codes in Fashion, Accessories & Jewelry category. If you cannot find any appropriate offer, check the coupons for Clarks, Debenhams, Dorothy Perkins purchases! Enter your Barratts voucher code in the box provided and click 'Apply voucher'. Standard UK delivery is £3.99 per order. If you need to return a product for any reason to Barratts, you can do so by simply returning your items in their original packaging within 28 days of despatch. Need to contact the team at Barratts? Whether you have a question about your order, want some expert advice on buying footwear or simply want to know more about how you could make big savings with a Barratts discount code, you can contact the Customer Services department by accessing the online contact form here. Want to find out more about what's happening behind the scenes at Barratts? Why not follow the company across your favourite social media platforms? You'll find lots of entertaining content to explore including competitions, promotions, new collection previews and more. You can also use these pages to find out more about saving money with a Barratts voucher code. Don’t forget to check them regularly, as you can never be sure when a free Barratts discount code might be waiting for you! Buy now online at www.barratts.co.uk. My son was constantly growing out of his school shoes, and new ones were costing us a fortune. That's why I was relieved to discover a Barratts voucher code online. 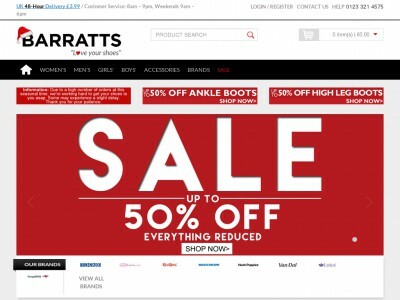 It's simple to use – I just log on to barratts.co.uk and enter my Barratts discount code for great deals on a huge range of shoes from famous labels as well as their quality own brand. With a Barratts voucher code, I got a great deal on some really smart school shoes and new trainers too. So if you've got kids that keep growing, check out a Barratts discount code.